Lapu-lapu grilled en papillote sounded like an equally dopey name for this dish as well. 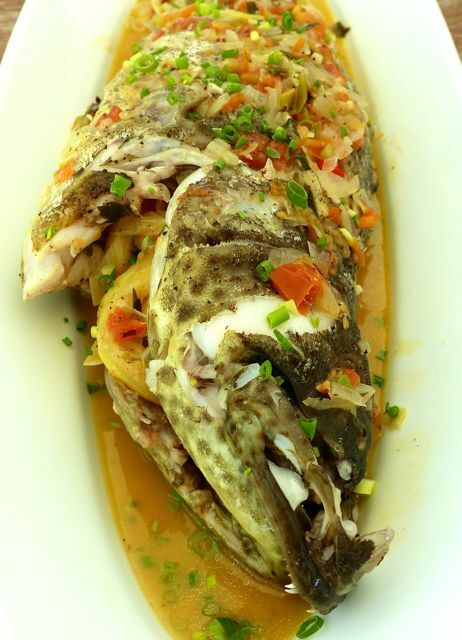 Basically, it is whole grouper or lapu-lapu, stuffed with some aromatics, wrapped first in baking paper, then foil and roasted over a charcoal fire. It was surprisingly good. Very good for very little darned effort. First, head to the local coastal town market nearest you (this was in Nasugbu over Holy Week). 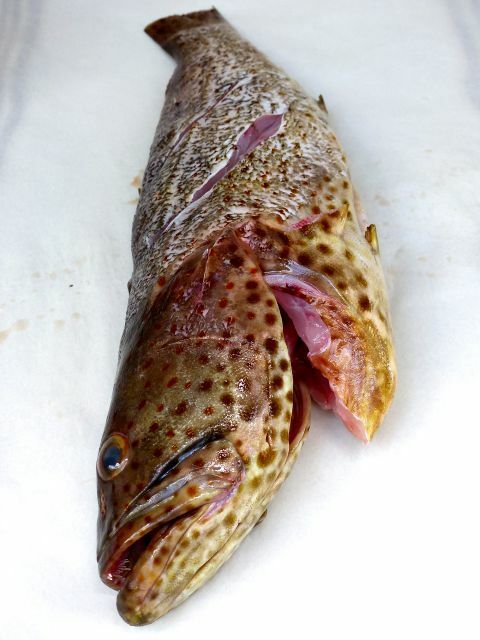 Buy a lap-lapu that is roughly 1.2-1.5 kilos in weight, and have it cleaned and scaled. First, head to the local coastal town market nearest you (this was in Nasugbu over Holy Week). Buy a lap-lapu that is roughly 1.2-1.5 kilos in weight, and have it cleaned and scaled. This one cost less than PHP500, despite the hiked up prices during the holiday. Back at home, chop up some onions, garlic and tomatoes and saute that in some olive oil until soft. 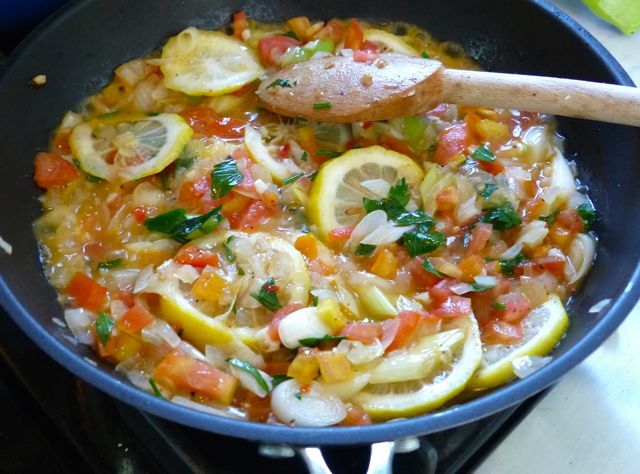 Add some lemon slices, salt and pepper and some chopped Italian parsley if you have it. Season the stomach cavity of the fish with salt and pepper and stuff it with some of the veggie mixture. 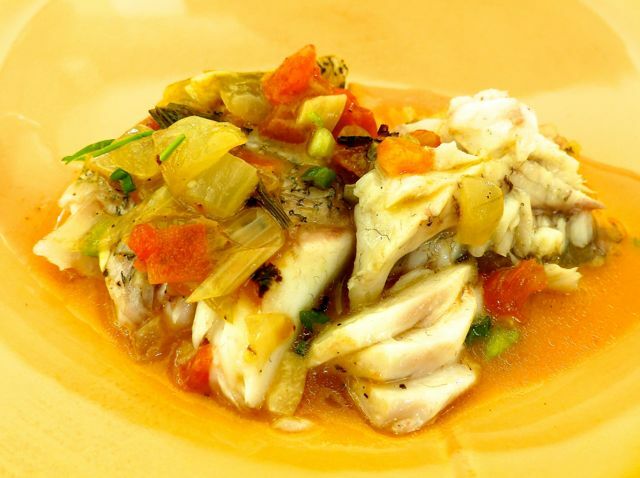 Place the fish over some parchment paper on top of some heavy duty aluminum foil. Scatter some of the stuffing under and over and around the fish. The foil is to deflect the fire from burning the paper and fish and to keep in moisture. The parchment paper is to ensure that the fish doesn’t stick to the foil, and to avoid an adverse reaction between lemon juice acid and the foil (the two or any acid don’t mix with the foil well). Drizzle with some good olive oil and season with more salt and pepper. Seal this all up and place over a charcoal fire for some 20 minutes or so until the fish is just cooked through. 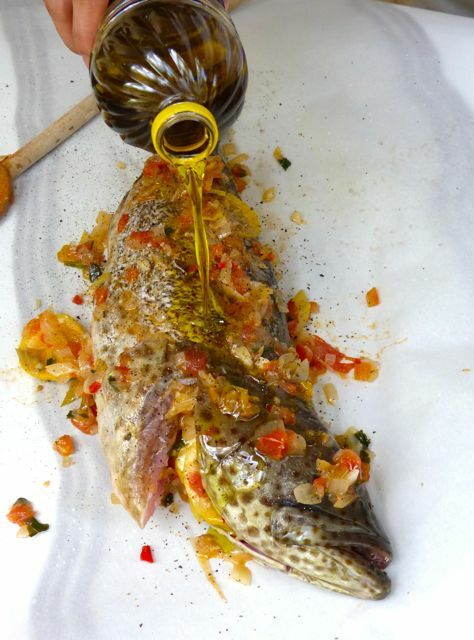 Transfer the whole fish carefully to a platter and add all the sauce and tidbits that fall off. Garnish with some chopped chives or green onions and dig in. Superb. And this easily fed 3 people. 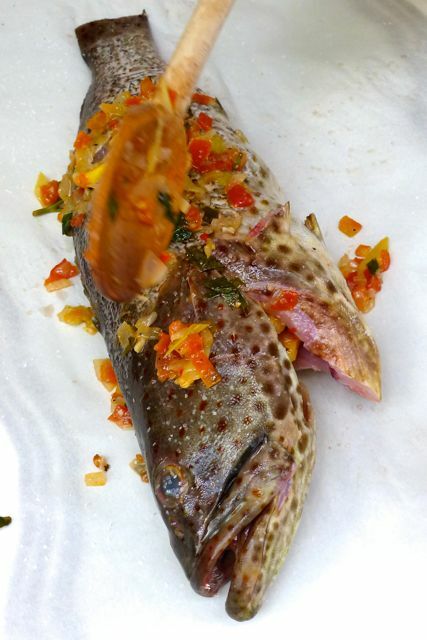 You could easily do this in an oven but allow a bit more time to cook the fish. Looks very good and sounds easy to cook! you can papillote anything, MM! While you are at it, cut a pear like Bosc or even Bartlette in eights and then arrange in sunburst pattern…apricot jam or mango jam in the center, finely chopped nuts like almonds or roasted casuy, light sprinkle of chopped chocolate or just sprinkle with cinnamon sugar and wrap. 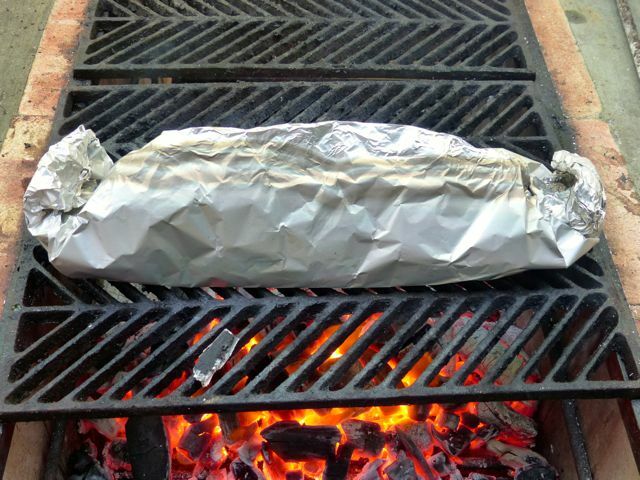 Wrap in foil as well and cook alongside your grilled fish. When done, unwrap , plate it and put vanilla bean ice cream in the center of the pear slices. Ms BettyQ, I got everything I need to do your sweet papillote. Thanks. ms. Ebba! Oven will do if you are not grilling anything. Since MM is grilling, might as well make use of the heat of the charcoal at sayang! But wrap it sosyal… Fold parchment in half, lay the sliced fruit on bottom half, put the goodies on, cover with top half and start folding like empanada crimping . Them when done, put the entire package on a plate and cut top with scissors. My first impulse if I were at home would be to go out the backyard and cut off a still furled banana frond. 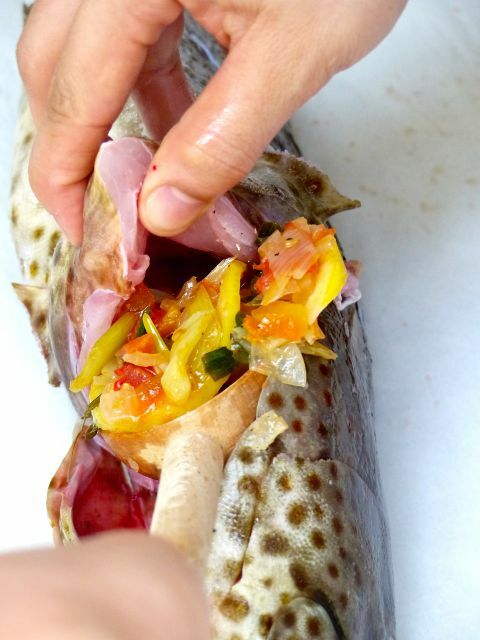 No sticking, nonreactive, imparts a nice aroma on the wrapped fish and green, in more sense than one. I’ve always wondered if there is a way to get the smoked flavored of the grill, with the fish still coming out steamed and succulent. This is awesome! Will try this weekend. BettyQ, I will also try doing that on the side.